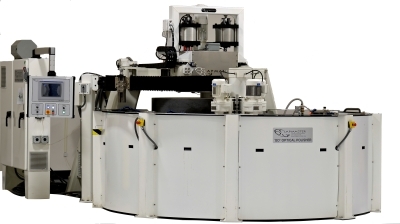 The air bearing line of optical polishers, available with 36″ and 48″ diameter pitch laps, are designed so that the pitch lap and support plate ride on a very thin cushion of compressed air. These machines are driven from an electric motor via a lay shaft, and power is transferred to the lap using a multi-vee drive belt around the circumference of the support plate. This unique design virtually eliminates vibration at the polishing surface, and dramatically improves component flatness and finish results.